Structural Resilience in Sewer Reconstruction: From Theory to Practice provides engineers with a balanced mixture of theory and practice. Divided into three parts, structural resilience is introduced, along with different methods and theories that are needed to assess sewerage networks. The authors begin with a general overview of resilience and lessons learned, then present a comprehensive review of resilience theories in key fields of study. 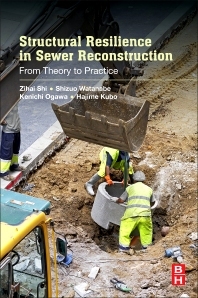 The book also introduces major analysis techniques and computational methods for resilience assessment, also highlighting sewer reconstruction projects carried out in Tokyo, including the reconstruction and development process for construction methods, renovation materials and technical inventions. The structural resilience considerations incorporated in various stages of development are discussed in detail. Computational examples for assessing structural resilience in the renovated sewer system in Tokyo are also shown, with final chapters summarizing structural resilience theories and areas for future study. Zihai Shi; R&D Centre, Nippon Koei Co., Ltd.; 2304 Inarihara, Tsukuba-shi, Ibaraki 300-1259He has engaged in renovation design of ageing sewers since 1995, and is familiar with resilience theories and practices in structural engineering. Shizuo Watanabe, Technical Supervisor, Bureau of Sewerage, Tokoy Metropolitan Government; Mr. Watanabe is the technical supervisor/deputy director at Bureau of Sewerage, Tokyo Metropolitan Government. Kenichi Ogawa, President, Tokyo Sewerage Service Co., Ltd. He is the former Bureau Chief, and has engaged in planning, design, construction and maintenance of Tokyo’s sewerage system since 1977. Mr. Kubo is the senior managing executive officer of Sekisui Chemical Co., Ltd, which is a world-class maker of chemical products. He serves as the general director for development of high-performance chemical products, including the development of lining materials for sewer renovation.